The Affenpinscher combines clownlike charm with a bold nature. His creative thought process never ceases to astound and entertain his people. He learns quickly and adjusts readily to change, making him a good traveler who’s always ready for a new adventure. People who live with Affenpinschers admire their sensitivity and gentleness but warn that they are the quintessential big dog in a small body. Powerful, intelligent, and sharp, the Affenpinscher makes an excellent watchdog that fears nothing. He’s not normally loud, but he is excitable. Once he’s on alert, it takes a while for him to calm down. He takes his duty to guard home, family, and territory seriously and won’t hesitate to alert the entire neighborhood that someone is approaching the front door. Regular socialization with people and animals is necessary for the Affenpinscher to grow up healthy and well-balanced. Without it, he won’t live up to his potential. The Affenpinscher has a mind of his own and is often labeled as stubborn. Fortunately, he’s eager to learn and please his people when he’s taught with positive reinforcement techniques. He can compete in agility and obedience, and his ability to amuse and entertain makes him an excellent therapy dog. While Affenpinschers are known for making their people laugh, they are not the best breed for a household full of children. The Affenpinscher adores his family. He’s not known to like children, and he will not hesitate to bite them if he gets provoked. The Affenpinscher is a character, and that’s part of his appeal. Consider getting one if you’re interested in a small dog who enjoys seeing the sights. 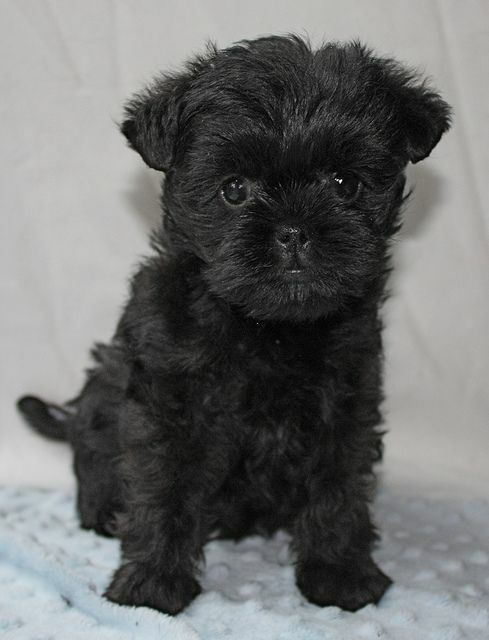 What Price are Affenpinscher Puppies? The price of Affenpinscher puppies is approximately $800 to $1,200. How to Find Reputable Affenpinscher Breeders? Not all breeders are created equal. If you think buying a puppy from any breeder will bring you your dream dog, you’re setting yourself up for disappointment. There are many lousy breeders out there. There are more bad breeders than good ones. A good, reputable breeder won’t just provide you with the perfect puppy. They will also be a valuable source of information about your dog’s breed. They will help you select the right dog food and grooming supplies. They will also provide a timeline for what to expect during your dog’s puppy years. They may even be able to help you troubleshoot training troubles. Finding a reputable breeder isn’t easy. Most of the time, you will need to be creative with your research and speak to many breeders before finding the right one. In many cases, finding a reputable breeder will require you to contact various breeders advertised in your area. If you know someone who owns a dog, ask about their experience with their breeder and whether they will recommend them. However, don’t discount the possibility that your friends used a bad breeder and had no idea about it. Asking around gives you a good place to start. Local breed clubs are usually very helpful resources when it comes to finding good breeders. You can even find specific Facebook groups relevant to your chosen breed and ask for advice there. Dog professionals may also give you some inside information about reputable breeders in your area. They’ve watched many local puppies grow up. They will know which ones have good genes, and which ones have suffered medical issues later as adults. Dog shows are where the best dogs go to show off their stuff, and plenty of reputable breeders will be there to accompany them. While puppies that have show-winning lineages may be ridiculously expensive, you can still get good referrals from other good breeders in your area. The Affenpinscher is also known as the Monkey Dog. Affen in German means ape or monkey, and pinscher means terrier. It is descended from the numerous small terriers that populated 17th and 18th-century stables and shops throughout Europe. The Affenpinscher must have caught the eye of the ladies because they were eventually bred to be smaller to be a companion dog. Socialization is necessary to keep your Affenpinscher well-mannered. The Affenpinscher has a shaggy but neat appearance. He has a thick, rough coat that is about an inch think on the body. The coat grows shorter in the hindquarters and becomes longer on the head, creating a mane around the Affenpinscher’s face. The Affenpinscher has a short, wiry coat that comes in several colors like black, gray, silver, black and tan, beige, or red. Some Affenpinschers may have gray or white hairs mixed or have a patch of stark white hair on their necks. He often has a slight underbite, but many Affenpinschers have an even jawline. His tail is almost always docked because this is the show standard. Maintaining the attractive appearance of the Affenpinscher takes a lot of grooming. He needs to be brushed several times a week with both a slick brush and a metal comb. His coat should also be stripped a few times a year to keep its characteristic look and feel. Stripping of the coat involves pulling dead hair out by hand. You can learn this technique from professional dog groomers. How Big is a Full-Grown Affenpinscher? The Affenpinscher stands between 9 to 11.5 inches at the shoulder and weights between 7 to 9 lbs. What is the Life Expectancy of the Affenpinscher? 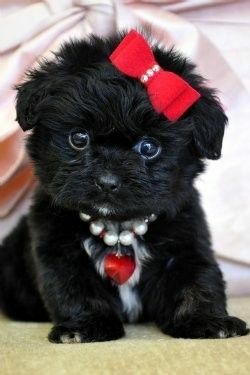 The life expectancy of the Affenpinscher is approximately 12 to 14 years. Affenpinschers are small, but they have very big personalities. They take themselves very seriously and require everyone else to take them seriously as well. They are considered purse dogs by women and make a great traveling companion. They are very flexible and easygoing when it comes to new environments and situations. Just keep an eye on them when they’re off leash because they do have a mischievous streak. Affenpinschers are classic yappy dogs. They bark at just about anything and everything. This can be controlled and corrected with early training, but it cannot completely go away when it’s in their nature. The Affenpinscher combines clownlike charm with a bold nature. Affenpinschers are easily adaptable to new situations. But if they are not properly socialized, they can become wary of new people and places, causing them great anxiety. They are generally people-pleasers, but they can also be stubborn. Early training is important to have a well-behaved and obedient dog. They respond best to positive reinforcement, with lots of treats and affection. Consistency and a gentle hand are required to prevent your Affenpinscher from becoming distrusting of people. They also make good therapy dogs. They make an ideal visitor because they lift people’s spirits quite effortlessly. 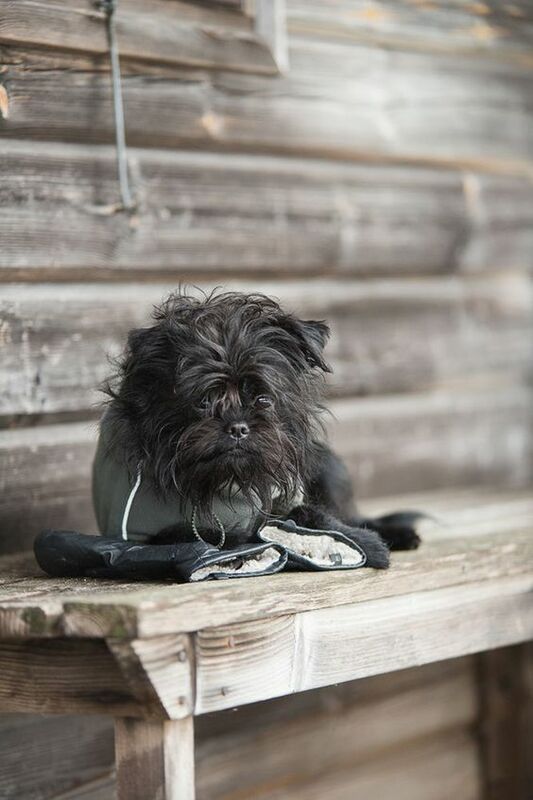 Depending on the size and age of your Affenpinscher, you will need to feed between 24 grams and 88 grams of high-quality dry food a day, divided into two meals. Keep your Affenpinscher fit and well within his desired weight by measuring his food. Feed him twice a day instead of leaving food out for him all the time. The Affenpinscher does not require excessive amounts of exercise. A few short walks a day will suffice. However, apartment-dwellers should be cautioned because Affenpinschers bark. While they are small enough to dwell in close quarters, they may drive your neighbors crazy. Affenpinschers are good family dogs. They love to play and are affectionate, but they can also be territorial and are not the best fit for a house with small children. When outdoors, Affenpinschers should be kept on a leash or in a fenced-in yard for their own protection. Affenpinschers are at an increased risk of suffering tracheal damage because of the wrong use of leashes and collars. Giving your Affenpinscher supplements that support joint health and making him wear a harness will lower this risk. Other breed health concerns may include heart problems and cataracts. The Affenpinscher may also be affected by hypothyroidism, hip dysplasia, and hernias. He can be prone to Legg-Calve-Perthes Disease, Von Willebrand Disease, portosystemic shunts, sebaceous cysts, oligodontia, and patellar luxation as well. The Affenpinscher is spunkier than most toy breeds. Somewhat high-strung, he tends to tremble when excited. If he senses an invasion of his space, he will try to look intimidating by becoming noisy and wild. Socialization is necessary to keep him well-mannered and properly behaved. In the home, he is an inquisitive busybody who must check out new sights and sounds. Affenpinschers do have a mind of their own. If you’re not a firm pack leader, he can be demanding and stubborn when he does not get his way. He might make you laugh out loud, but don’t spoil him.